Hi, i would like to ask if it is okay to check in my reserved room at around 10pm.? is this hotel near waterfront cebu city hotel? coz we’re going to have a seminar from august 8-11, 2018 on this hotel. tnx. Please consider Deluxe Room instead. Is there an available room from May 23-26? I would like to book 2 economy rooms (2 single bed). Please send quotations. Thanks. 800 per night available on that date? Can I reserve for the Economy Room on November 22-24? If not, how much will the rates be? It’s okay if there’s no breakfast. Hi, I am looking for accomodation for 20 teachers who will be attending a conference in cebu on dec 7-12, 2017. Can u provide room rates on economy rooms. Family rooms etc. Hello! By any chance, do you allow 17 year olds to check in? Do you have any promo rate on oct 5,6 &7, 2017 for a room with two single beds? – What is the check-in time on OCT 05? 2pm? – What is the check-out time on OCT 08? 12noon? – 2 adults only? no children? – What is your check-out time on AUG 29 ? Hi do you have family room for aug 13-16? For 6pax.Check in time 3-4pm and check out 3am on the 16th. Do you accept discount for senior citizens? – Our discounted daily rates are already discounted. – Family Room is 4 persons. For 6 persons, at least 2 rooms. Hi, your economy rooms are still first come first served basis? are this rooms are airconditioned ? We also have buffet packages which you can combine with your own kiddie party items. Please check your email for details. Hello. Good morning. Naa pa mo economy room na available for today? Hi what room ang naay bathtub? Bathtub ( limited ) – only Superior, Family, Condos and Suites. Hi, ask unta ko if pwede mo check in around 9pm? Mao man gud akong out sa klase and mag check in unta kos inyung hotel. And how much is the room rate good for 2 persons for standard room? Mo check in unta me ika friday puhon Sept. 30-Oct.1. So bali 1 night ra cya. Do you still have economy? If you mean for today – I am sorry, no more Economy for today. For cost, please pick which rate and multiply by 15 nights. Please be advised that Economy Rooms are Walk-In Only. First come, first served. Cannot be reserved. The email you provide is invalid. Hi,can we get a room good for the event lang..like for the preparation para sa things. Hello. Id like to ask if okay ra ba na di overnight? Kay murag igo ra mi mag prepare for an event. Is it possible to check in at around 7 to 8 am? Any available room this coming Jan 17-19? Hi! Is early check-in possible, say 5 in the morning? Also, is there a discount rate for 12 hours stay or less? I would like to reserve an economy room for September 18th (this friday). We’ll check in at 5am (if possible) and check out at 4pm the same day. Thanks. Can we possibly check in at 5 in the morning ? What time is the check out? Will it still be the next day? 5am early check-in to next day 1pm check-out still equals 1 day-night BUT the hotel staff cannot promise or guarantee early check-in. Where can we a book a room online? We’ll be there by next week. We got family room and stayed there for 2 nights. Service is good as well as the staffs.. 2 thumbs up. =) my parents were satisfied about our stay here.. one thing i can suggest is pls add more choices for the breakfast menu.. heheh.. definitely we’ll be coming back.. Thank you very much for your feedback. We’re glad that you found your stay satisfactory. Hi po. Mgkano po good for 2 pax? I bed lang. We will be staying for 5 nights. Please be advised that Economy is 2 single beds only and no window. Hello, I would like to make a reservation for three adults (economy) from April 20-25, 2015. If available, kindly send us the details. Thank you so much in advance. 3 persons in MPH Economy is not possible. Please consider MPH Superior instead. We apologize that your stay wasn’t pleasant. We have forwarded your message to Manager Yorlin. Thank you for informing us. Do you still have an available room on Jan 17-19 for 4pax? Please let me know. Thanks. Hi, can i have a reservation please this coming january 17-19, 2015 for Sinulog festival (2 nights and w/o breakfast) economy room? And please tell me how to manage the booking I don’t have a credit card yet. Thank you. You need at least 3pax room. Please also provide approx. height of the child. We also need approx. check-in time on Jan. 19 and approx. check-out time on Jan. 21. Hi! Can i book the economy room we are 3 adults and 1 child. Check in time will be January 19-21, 2014..pls response. How to manage the bookings I don’t have credit card.tnx! Hi, I would like to reserve 2 Economy Rooms for 2 persons each without breakfast from November 26-29, 2014. Approx. check-in time is 11:30 am-12:00 noon and Approx check-out time is 12nn. I have read the hotel policies and agree thereto. Please advise if economy or superior room is available on November 26 to 29 for 3 pax. Please provide the rates. Only 3 persons will be checking in ? Please provide approx. check-in time on Nov. 26 and approx. check-out time on Nov. 29. We will be in Cebu to attend PICPA seminar on November 26 to 29, would like to know if you have economy or superior for 3 pax on those days. Would appreciate immediate reply. I made an online reservation last July this year for Economy 1 adult and 2 kids (6 yrs old and 2 yrs old) with breakfast for December 26, 2014. Also, I’ll be celebrating my daughter’s 7th birthday on this date. Can you checked if already reserved under the name of Maria Christina O. Barrios. Hoping for your favorable response soon. We are having difficulties finding your reservation. Please provide more details. Did you book directly with the hotel via telephone ? 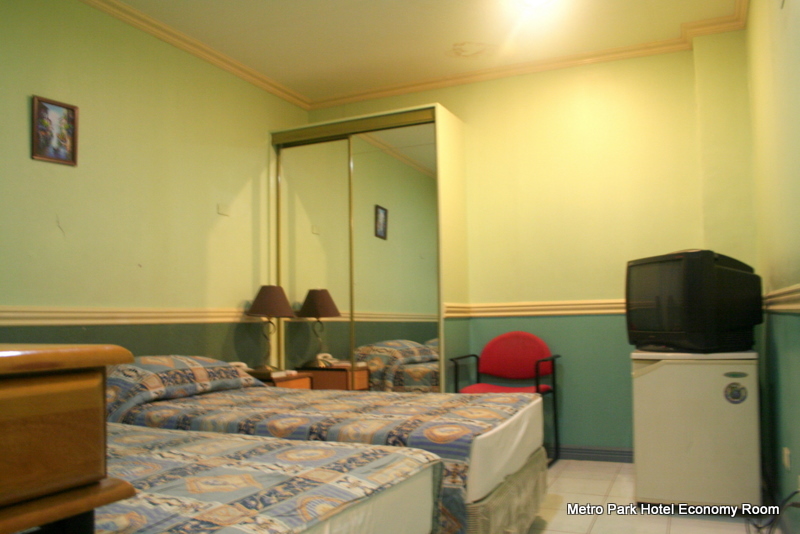 Did you book via the metroparkhotelcebu.com ? Via another online booking site ? Please specify which. Via a travel agency ? Please specify which. Is the 950 with breakfast for 2 is still available? We will be in Cebu on September 20 to 23, 2014. Available. For reservation, please fill out the reservation form. If we avail the economy room with breakfast, do we also have the privilege to use the pool with no extra charge? Swimming Pool – available to in-house guests for free from 6am to 9pm except during maintenance and pool parties. i want to book on july 10 – 14, for an economy room, do i have to pay in advance? June 15 (2pm check-in) to June 20 (1pm check-out) counts as 5 day-nights. Please pick a daily rate and multiply by 5.
i would like to reserve a economy room from May 18 until May 19, 2014..how much is the rate for the room ? thank you and god bless!! May 18 (2pm check-in) to May 19 (1pm check-out) counts as 1 day-night. Please check above for the discounted daily rates. hello. I would like to know how much it cost to book a room good for three persons, scheduled date will be on May 4-6. this is without breakfast package. I am planning to stay in your hotel. How do I confirm my reservation? I would like to book your Economy room w/ breakfast for 2 for the 8th and 9th of April for 950 php. We will arrive late (around midnight). MPH Economy has no window. Is this okay? Please provide full name for reservation name. Please provide approx. check-out time on April 9. Midnight check-in – is it the midnight between April 7 and 8 or the midnight between April 8 and 9? Double means 1 matrimonial bed. Twin means 2 single beds. is it possible to check in top ur hotel at exctly 8am then out by 7am @ jan 31 2014?? …and how much it will cost??? Your dates and times would count as 1 day-night. So, 800 to 950 pesos for MPH Economy. I would like to reserve a economy room from (Jan 17-19) 3 nights. Please reply to my email soon as possible when you read this. Do you have short time .check in? No short time rates. Just daily rates and monthly rates. If we will just stay like 8 to 10 hours?how much? Hi. We are planning to check in on Jan 29(around 7am) but we will not stay overnight as we have another flight at 7pm (so we have to check out around 4pm), the same day. There are 5 of us (4 adults and 1 kid). Can we just book 1 rm? Thanks. May I reserve 2 economy rooms (with breakfast for 2) for Jan. 12 and 13, 2014 (2 nights)? Please be advised that MPH Economy does not have windows. For reservation, please provide approx. check-in time on Jan. 12 and approx. check-out time on Jan. 14. I would like to reserve an economy room with breakfast for two (2) at Php950(2 single beds)for December 25-28, 2013. We will check-in at 7pm on December 25,2013. Please email us for confirmation, and total. Thank you. Hi ! I would like to reserve on dec.24 @ 7pm and check out on dec.27 @ 3pm. If theres available? Thank you. I have no credit card yet. Available. For reservation, please provide approx. check-in time on Dec. 25 and approx. check-out time on Dec. 27. We have also sent you an email with more details. If you don’t see our email, please check your spam or bulk mail folder. good day! i would like to ask if you have an available economy room from dec 15-16 2013, without breakfast. how much would be the total cost? and if it is possible can we check in around 10 am we will be checking out as early as 4am on the 16 anyway, thank you. Economy is available for your date, but please be advised that MPH Economy has NO window and has 2 single beds. If you want with window or 1 matrimonial bed, please consider MPH Standard instead. 4:30 am to (before) 2 pm early check-in has limited availability. IF available, there is no extra early check-in charge. Please try to avoid checking in before 4:30 am as it incurs an extra night charge. Early Check-in has limited availability because most guests prefer to check-out at noon and housekeeping needs time to clean. Do you still have available room for november 22-24,2013 for 2 pax? Preferred room type is economy w breakfast. MPH Economy is available for your dates, but please be advised that MPH Economy has NO window. If that’s a problem, please consider MPH Standard instead. No prob. What will be the procedures and mode of payment if ever were going to book? Do you also cater airport transfers? Thanks!! Please be advised that MPH Economy has NO window. If that’s a problem, please consider MPH Standard instead. Advance payment isn’t required. You just pay at the hotel during check-in. For reservation, please provide approx. check-in time on Nov. 8 and approx. check-out time on Nov. 10. If (above) is okay, please let us know the required information so we can process your reservation. Hi. 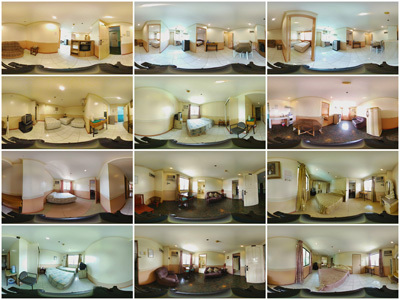 Is this room available on September 28 – 30 2013? Do you give discount for 15-30 days stay sinlge room?I dont mind the smallest one. Hi, I would like to inquire if you still have an available Economy room on June 4 to June 7? And If possible, can we have an early check in and early check out like 1 am on June 4 and check out on May 7 at 3 am for a total of 3 nights? Thanks! June 4 (1am check-in) to June 7 (3am check-out) would count as 4 day-nights, not 3 day-nights. Are the promo rates still available for July 2013? Is there a discount rate for economy room for 12 hours stay or less? Kindly please confirm at this #-snip-. January 27 (2pm check-in) to February 1 (1pm check-out) counts as 5 day-nights. MPH only has discounted daily rates and monthly rates. No weekly rates. A 5 day-night stay will still be based on the discounted daily rates. hi, i would like to inquire how much your economy room if we will stay for about 5days? MPH Standard 2pax is available for Jan. 26 (2pm check-in) to Jan. 27 (1pm check-out). Credit card isn’t necessary to make a reservation for 1 room for Jan. 26. If this is okay, please let us know so we can process your reservation. Please also provide preferred bed-type. 1 matrimonial bed or 2 single beds? We have also sent you an email. If you don’t see our email, please check your bulk or spam mail folder. good day!may available pa for jan 20?, i’d like to reserve an economy room, no breakfast . i’ll arrive with my girlfriend jan 20 early in the morning,we’ll stay for just a night. we’ll leave on the following morning. hi! i’d like to reserve an economy room, no breakfast . i’ll arrive with my mate tomorrow evening to stay for just a night. we’ll leave on the following morning. Hello I am booked to arrive in Cebu Monday 20th May nd I would like to book a economy room with breakfast P950 a night untile Sunday 26th May,Regards Wayne. May 20 (2pm) to May 26 (1pm), 2013 counts as 5 day-nights. 950 pesos X 5 = 4750 pesos (w/ breakfast for 2) Tax already included. We have sent you an email with more details. If you don’t see our email, please check your bulk or spam mail folder. Please send me a quotation for July 31-August 7, 2013. Thanks! Jul. 31 (2pm) to Aug. 7 (1pm) 2013 counts as 7 day-nights. For MPH Economy, that would 6650 (w/ breakfast) or 5600 (no breakfast). Tax is already included. Hi… My husband and I will be in Cebu on Dec 14 – 18, 2012. Can you please reserve one economy room (no bkfast) for us. Thank you! Please be advised that MPH Economy does not have window and always has 2 single beds. December 14, 2012 (2pm check-in) to December 18, 2012 (1pm check-out) counts as 4 day-nights. Guests will be initially requested to deposit a minimum of 1500 pesos. Must cover the first night and the incidental expenses deposit (typically 500 pesos in cash). If this is okay, please let us know so we can process your reservation. We have also send you an email. If you don’t see our email, please check your spam or bulk mail folder. MPH Economy is still available (right now – about 4pm). all have 2 single beds. how much total from jan 16-21, 2013 economy with breakfast? how much jan 16-21, 2013 economy without breakfast? the difference. please reply asap. Only tariff rates are available during Sinulog. Jan. 16 (2pm) to Jan. 21 (1pm) is 5 day-nights. 1190 x 5 = 5950 pesos (w/ breakfast for 2) | Tax already included. Please be advised that Sinulog reservations require advance payment. how much rate without breakfast? 800 pesos per day-night for MPH Economy, but this rate is not available during Sinulog. how much is the rate jan16-21 without breakfast…..
Those dates are during Sinulog. No breakfast rate is not available on those dates. good day! i would like to ask if you have an available economy room from jan 16-21, 2013, without breakfast. how much would be the total cost? do you allow smoking in economy room? thank you. Please check your email for our reply. If you don’t see it, please try your spam or bulk mail folder. Thank you. Hi! Can i have a reservation for this room for Sinulog Festival 2013? I have already booked my flight and we’ll be arriving on Jan. 19 (sat) and we’ll be leaving on th 21th (mon). .
My apologies. I was in a hurry yesterday and misread your comment. I thought you wanted an extra bed in MPH Economy. About your family of four staying in MPH Economy. Children below 4 feet (in height) are not counted as PAX. Children 4 feet and up are counted as extra persons. 4 feet is the height of the front desk station. If neither of your children is at least 4 feet up, they can stay for free in the Economy Room. If your 10 year old is already 4 feet, you’ll have to get a 3pax room (Superior) or 4pax room (Family). As for credit card, we usually do not require card information for 1 room reservations. MPH Economy can’t have extra bed. We would recommend MPH Superior, but no Superior available for those dates. Please consider MPH Family Room B (still available for those dates). Oct. 16 (2pm check-in) to Oct. 19 (1pm check-out) is 3 day-nights. 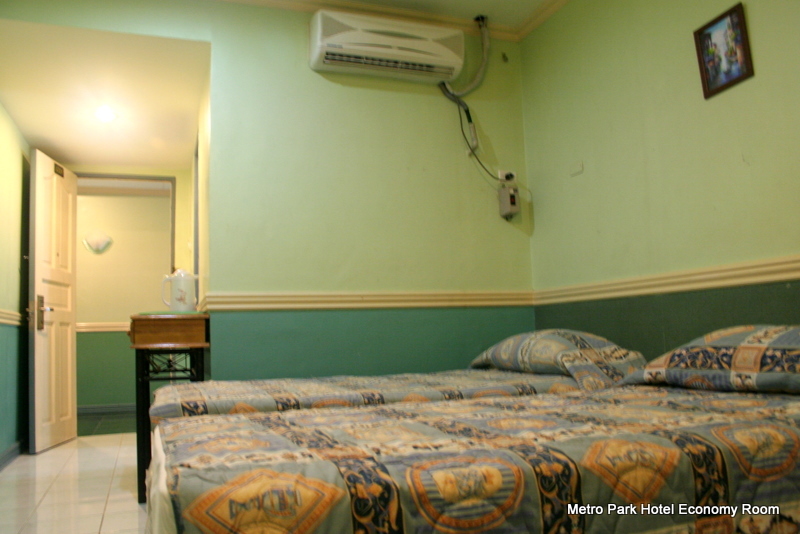 MPH Economy is 800 pesos per day-night, per room. No breakfast. Tax already included. NO window. Only 2 single beds. 2 persons only per room.